Want to know who never sits down on the job - literally? 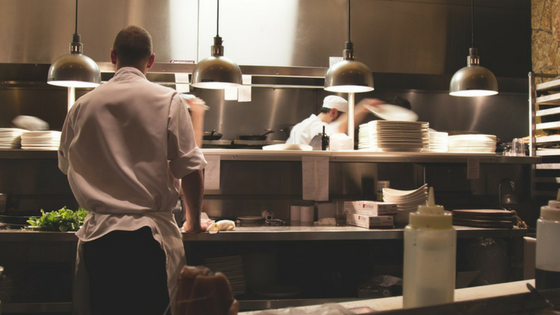 Look no further than workers in the food service and restaurant industries. Food prep and serving workers only sit, on average, 1.7% of their workday. Restaurant cooks aren’t far behind, only sitting 2.6% of the time, and many other food service workers such as dishwashers, waiters, restaurant hosts and bartenders follow close behind on a list of the country’s most standing-heavy jobs. There are many hazards associated with standing for long periods of time, especially on a hard surface. Some of the most common include muscle fatigue, particularly in the back, legs, and feet, musculoskeletal disease and joint compression. Standing for most of the day also puts workers at risk for varicose veins and can more than double their risk of heart disease. Such discomfort can even negatively affect mental health. So what can you do to support your food service industry workers? There are several key considerations. You can educate them on performing dynamic movements and static stretches in a small area. You can encourage them to wear shoes with proper support and institute more frequent breaks. But in the middle of a busy restaurant kitchen, these initiatives can be difficult, impractical, or even impossible to implement. At Wearwell, we know the most important part of the equation - make changes to the work environment to better support your employees. Our scientifically advanced anti-fatigue floor mats are designed specifically with the standing worker in mind. This unique flooring softens the ground and lightens the load for millions of workers the world over. By reducing impact to various parts of the body, particularly the feet, legs, knees and hips, anti-fatigue matting improves circulation and softens the pressure on joints and muscles. This is huge for the restaurant industry. Installing Wearwell anti-fatigue flooring can lead to a rise in productivity, a decrease in sick days due to bodies that feel stronger, healthier and less sore, and an overall improvement in the feeling of well-being among employees. In addition to offering anti-fatigue benefits, certain Wearwell mats are also designed to reduce slip, trip, and fall accidents by elevating workers above spillage and debris in the work area, a key factor in the food service world. Mats designed specifically for food processing are easy to clean, easy to move around, fight contaminants through infusion with anti-microbial and anti-fungal additives and resist animal fats. An open-grid design allows debris and fluids to flow through and elevates employees above the spills. Making the decision to give your restaurant and food service employees a first-rate foundation on which to stand demonstrates your commitment to their safety, their comfort and their overall wellbeing. Knowing that you are invested in them will inspire them to be invested in their work, allowing everyone involved to excel and show up day after day to give their best effort even as they spend almost every moment standing. Need some help identifying the best flooring for your workplace? We are happy to come to you and perform a free site survey. Contact us today and begin this investment into your food service employees’ well-being.